Bringing home a new post-op amputee cat or dog from the vet is just like bringing home a newborn human baby. Having certain supplies makes the recovery phase much easier. 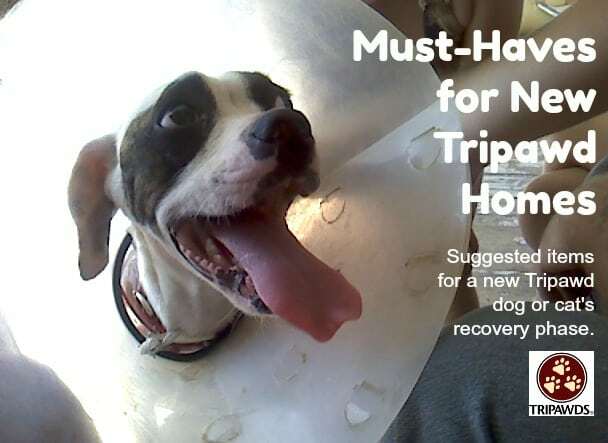 Here’s a short Tripawds recovery shopping list to help make the first few weeks easier. Stock up uon these must-have items for new Tripawds. In addition to the amputation pain management medications your vet sends home, here are some handy post-amputation items recommended by the Tripawds community. No-slip rugs or yoga mats for traction. Give your Tripawd confidence by providing traction in your home. You don’t have to cover entire floors, just enough to create a path for your Tripawd to navigate around your home. Traction is a must to avoid falls and injuries. Canned food and irresistible treats. Most recovering Tripawds have weak appetites, which is a common side effect of pain medication. Stock up on tasty food and follow these tips to get dogs and cats eating again. Low-sodium broth, Gatorade or other tasty pet-safe beverages. Spiking your pet’s water dish with yummy flavors can encourage drinking liquids. This is important for recovery. Fiber-rich foods. Most recovering Tripawds will become constipated. This is another pain medication side effect. Have fiber-rich foods ready to encourage bowel movements. Pumpkin pulp, steamed squash, bran flakes and other similar fibery foods can help move things along. Extra blankets, sheets and towels. Sometimes a Tripawd will experience bodily fluid fluid leakage at the incision site, known as a “seroma.” It’s usually not a problem but often messy. 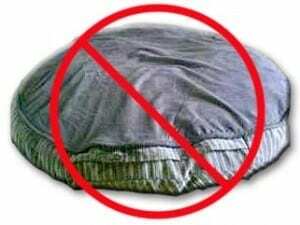 Keep your pet’s bed covered. If a seroma occurs, let your vet know but don’t panic. Most go away on their own. Potty pads. Some Tripawds have elimination issues after surgery. Be prepared for accidents if your Tripawd is too medicated to walk to their usual potty spot. Modified litter box. Feline Tripawds can have challenges getting into and out of their usual litter box. This Litterbox Tips for Cats blog post shares how to make life easier after surgery. You can even make your own DIY litterboxes for cats with extra challenges. Baby gates or other confinement method. New Tripawds should be kept in smaller spaces to discourage rest and excessive activity. Use whatever pet confinement method you can to prevent your dog or cat from roaming around the home. Small T-shirts, boxer shorts, baby diapers or baby onesies for cats. Placing the appropriately-sized clothing item on your Tripawd can discourage licking at the amputation incision. Bothering the incision can cause infection or pulled stitches and staples. These DIY pet surgery recovery suit tips and are easy and inexpensive to try. Hot / cold compress. Swelling and bruising after amputation surgery is normal and common. A hot or cold compress can help your pet feel better. 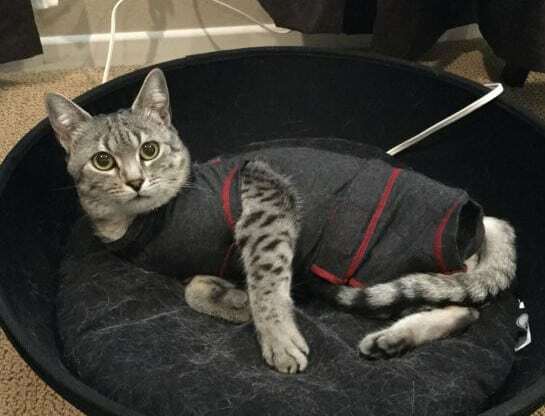 These Heat and Ice Therapy Tips for Tripawd Cats and Dogs explain the correct way to use a hot and cold compress. Tia doesn’t mind her new wardrobe. Grocery bag sling. Unless you have stairs in your home, there’s no need to put a harness on your dog and potentially irritate the fresh wound. Instead, try this DIY Tripawd Dog Sling you can make with a canvas grocery bag. Tripawd-approved harness. We love the Tripawd dog harnesses in our Gear Shop for many reasons, such as helping dogs in and out of vehicles, up and down stairs and assist on slippery floors. The right sized harness for a Tripawd cat can prevent accidental escape during walks. But these items can wait until stitches come out. A better cone of shame recovery collar. We can put a man on the moon but can’t seem to make a cone of shame recovery collar that animals don’t hate. A few pet recovery collar alternatives are worth considering if your pet is known for outsmarting the cone of shame. Orthopedic pet bed. Firm mattresses are best for Tripawd dogs or cats. Big fluffy beds can make it hard to get comfortable and possibly trip up your new amputee. These orthopedic pet beds for Tripawd dogs get rave reviews. 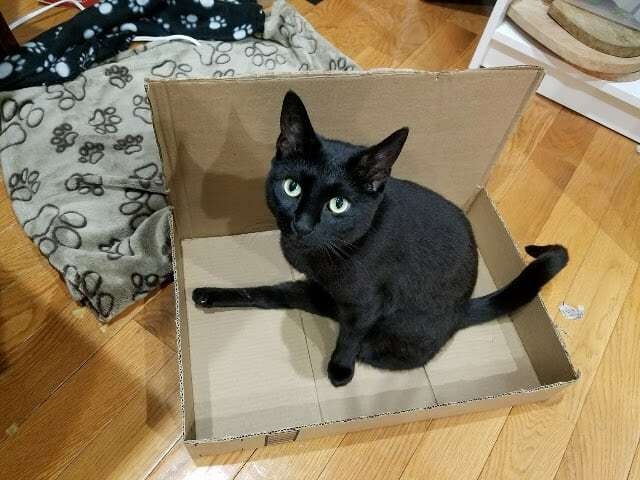 We would love to hear from TriKitty families about the best beds for Tripawd cats. Fluffy dog beds are a no-no for Tripawds. Raised feeder station. Animals eat standing up but when one leg is missing, it makes balancing while drinking and eating quite challenging. Raised feeders for dogs and cats help with better posture and stability. Exterior ramps. Don’t assume your dog will use a ramp. Most will not if they’ve never used one before. Don’t buy or build one until your dog is healed and you can try these ramp training tips. Pill Gun. There are many ways to give a dog or cat pills. The best way is to use a variety of methods and mix it up so your pet never knows it’s coming. Having a Pill Gun on hand is very useful for when medication time becomes difficult. Greenies or Pill Paste have also proven helpful for picky pets. Whether you have a cat or dog amputee, Tripawd-proofing your home goes a long way to building comfort and confidence. Do you have other ideas that make recovery easier? Comment below and we’ll make sure they get added to the list. In your description of the Ruff Wear Webmaster, you state, “Most people find it works well for their front or left leg amputee,…”. Does that mean it does not work for right rear amputees, or is that just a typo? My foster dog is a recent right rear amputee and, before reading your arricle, I had been very interested in the Webmaster for him after he heals. The Web Master works very well for any front or rear leg Tripawd. Where did you see that quote Ann? It clearly isn’t in this blog post where you commented. I tried a syringe for water won’t take it and she reacts badly when I try to give her food (ground chicken) trying to get pain meds down as well as antibiotics. What I am really worried is the lack of water and I am at a loss. She had the amputation just yesterday morning, I brought her home the same day. Pain meds I was able to get into her by sliding it back on the inside of her mouth until I can get it around the back tooth. That was yesterday. Today she just spit it back out. Precious lost her leg due to a dog attack. She is not a fighter and ended up with left front leg amputated and an ACL repair once I get this healed. Any advice would be helpful as I am concerned. Will call the vet when they open. Have basically been awake all night caring for her. Hi Margaret, we are so sorry to hear about Precious, and very glad she is going to heal. Did you try spiking her water with low sodium broths? Tuna water? Usually that does the trick. Please hop over to the Forums when you get a chance, you can talk to others in the community and find lots of feedback there. We look forward to hearing from you! Having been through this with Pele, I read through this and did a mental checklist of “yup”, I did/used that…to every item except the cone…I was lucky enough to be able to take time from work for her recovery. The only other thing I needed for Pele in the first few days of being home when she was so heavily drugged was a seringe to give her water without her having to move. I used the ones that came with her Metacam…it worked perfectly. Just use a small one like that and dispense slowly (with a bib or towel under your pup’s mouth because you don’t want your dog to choke. I am so thankful to have found this resource! Our 7 year old rottie was scheduled to have a cancerous tumor removed yesterday and ended up with a front leg amputation. We just brought her home today and now I know what we really need that our vet did not mention! Best wishes for a speedy recovery! For help finding the many other Tripawds resources and assistance programs, start here. I have never used a Yoga mat before, so I have no clue what they even feel like. My baby boy Benny is scheduled to have his front leg amputation in a couple weeks. Malti-poo medium sized, 20 lbs. They found a malignant tumor. Do Yoga Mats stick to the floor well and not curl up? I also have a disability and use a cane because of my leg. Whatever I get to help Benny has to not curl up so either of us will trip on it. Hi Benny and family. Yoga mats definitely stick well as long as you buy a quality one, not a cheapie (say in the $10 range). They will curl when you first unroll them but all you need to do is curl it the opposite way until it’s flat. The best thing you can do though is get carpet runners, which are just about $15 and up. Best wishes to you and Benny on surgery day, please join our forums and keep us posted. You know, I was wondering about a shopping list, of sorts, to prepare us for when LB is able to come home. What a great idea that you have thought of that already. Everything is common sense but at the same time, there are probably things I wouldn’t have thought of on my own. Luckily, I can cross a couple of items off of my list. You are a life saver! So much info and its really helping me with my little Soph. Paw shucks Soph & Lauren, we are so glad that you found help when you needed it. Thanks for joining the community (but sorry you had to of course!). My french mastif Lucy had her front leg ampertated nearly 4 wks ago due to bone cancer, at first I hated myself to have put her through it but I still have my baby and she is doing great. I found the easiest way to get her to drink after the op was squirting water into her mouth using the syringe from meticam and she loves it. She now drinks great and the only food I could get her to eat was a really high protein cat food . She is now eating bakers beef moist food, not my choice but she likes them. It’s only these last few days I can see a fantastic change in her. She is HAPPY and my girl is getting back to how she was. I have a stroller on order for her so we can go on long walks with our other dog. I have been really lucky with Lucy as she will use a car ramp and will love the stroller as I used a friend’s. My advise is to try everything you can to try n get your dog to eat, I definitely recommend trying a syringe to get them to drink. Thanks so much for sharing your experience with Lucy. You’re a wonderful parent and she’s a rock star! I’m really glad to hear things are going well. Keep on hoppin and bark if we can do anything to help OK? WOW!!!! So well put together! A lot of time and thought went intoo this! Thank you soooo much for this great “go to” list for recovery preparation. It is one more way to reduce the stress level when trying to navigate through all the uncertainties when first bringing your tripawd home. You are so welcome Sally! Happy to oblige. What a great post! I love that this pulls everything together in one place! Perhaps you want to add raised food bowls for the larger dogs? Oh my gosh how did I forget the raised feeders? Thank you for that reminder! Adding them now.